The hosed-on concrete was used to reconstruct the entire exterior wall, down to the handcrafted "stonework." A renovation was designed to preserve its sleek, mid-century appeal. 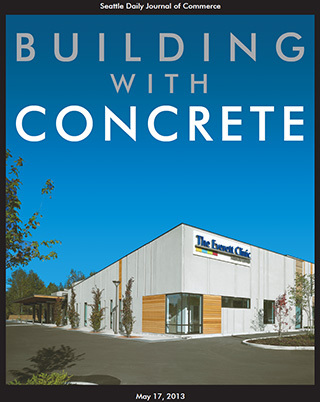 The Everett Clinic Smokey Point Medical Center won the grand award at the Washington Aggregates and Concrete Association's 45th annual Excellence in Concrete awards. The clinic earned its honors in the tilt-up structures category.